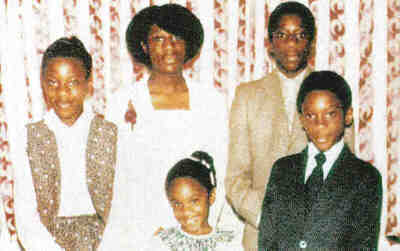 This early picture of the children of the Henry family was published in Newsweek, May 17, 1993, pg. 50. All five—Diana, Paulina, Vanessa, Phillip, and Stephen—were killed during the Waco Holocaust. We have noted before that, when talking about the numbers and identities of the Branch Davidians at the Mt. Carmel Center, the government's numbers do not add up. The death toll is a case in point. We have also seen contemporaneous newspaper accounts that 14 Branch Davidians died the first day, and many more were injured. We have noted no newspaper accounts of injured persons coming out during the siege. 55 who were "unaccounted for"
This "information" is yet another piece of disinformation and an attempt to confuse. The "unaccounted for," by definition, must be those people who were lost in the fire. Yet there were only 55 names in that list, not 86. Of those 55 "unaccounted for" names, three were "reportedly" killed in February. Among those is the name of Michael Schroeder. Yet Michael Schroeder had been killed in an open field outside the Mt. Carmel Center—the Texas Rangers/FBI had authority over the body since February 28. There was no "reportedly" about it: Michael Schroeder was dead. The name, "Jillane Matthews," appears on the "unaccounted for" list. This is the first and last time a "Jillane Matthews" is mentioned; she is not on any list of the dead, and did not leave during the siege. Thus of the 55 names of persons on the "unaccounted for" list, three had died in February, one was possibly fictitious—that left 51 names available for fire victims. Yet the FBI claimed there were 86 fire victims. Again, the US had a number of sophisticated eavesdropping devices monitoring the Branch Davidians, informants among the Davidians, and unlimited access to the Branch Davidians who left during the siege. Through any of these means they must have had the names of those who were in the Mt. Carmel Center on April 19. The FBI obviously had the names of those who allegedly escaped the fire. Therefore, the names of those who died should have been immediately obvious. Why the reluctance to reveal those 30-odd missing names? The news services provides us with additional death toll information and numbers. The Chicago Tribune, April 21, 1993, reported that fire survivor Clive Doyle's daughter and grandchildren had been killed in the fire. "Doyle survived Monday's inferno, but his 18-year old daughter, Shari, and several grandchildren apparently did not." Clive Doyle has stated that he had no grandchildren and that the newspaper report was mistaken. On April 19, CNN reported that twenty people had been seen escaping from the inferno, but there is no authenticating video footage. 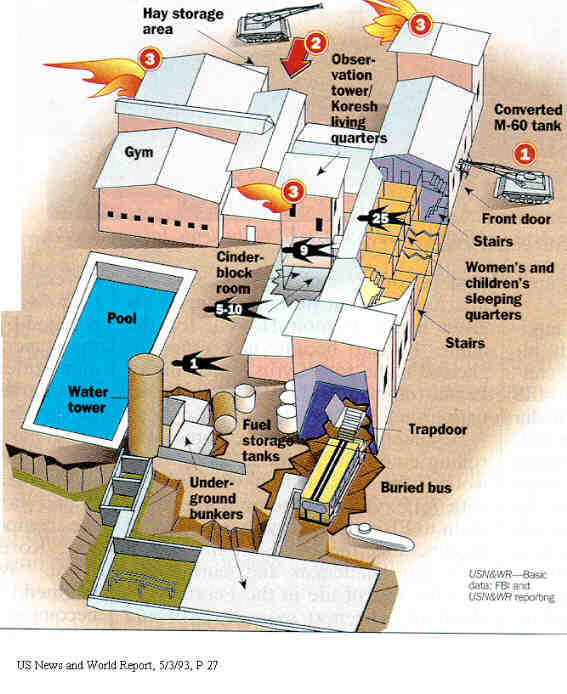 Newsweek, May 3, 1993, reported that 40 to 45 bodies had been found, including five to ten inside the pantry/concrete room, and one near the swimming pool. The Washington Post, April 21, 1993, reported that "Authorities' most recent, but unconfirmed, count of those inside before the assault was 95, including at least 24 children." The Washington Post, April 30, 1993, reported that "The grim death toll in the fiery demise of the Branch Davidians compound here rose to 77 today …"
The Dallas Morning News, May 6, 1993, reported that 72 Davidians had died in the fire. —all of these were available to furnish the identities of those in the Center at the time of the April 19 fire. There was no reason at all for the FBI or anyone else to consult David Koresh or rely on his information. According to Branch Davidian fire survivor Clive Doyle, 82 Branch Davidians died between the days of February 28, and April 19, 1993. This number includes six killed on February 28, 1993; Clive Doyle and the FBI/DoJ agree on this point. We have already noted that the report of six dead eclipsed The Dallas Morning News, March 3, 1993 account of 14 dead on February 28. See Mt. Carmel Deaths, February 28, 1993. The DoJ Report (Redacted Version), published on October 8, 1993 states that 75 persons died during the fire. At the time of publication, many of the remains were unidentified. Since that time, Clive Doyle composed a complete list of the dead Davidians. The list shows 82 died. Among the 82 are two fetuses found with the mangled bodies in the concrete room. When the two fetuses and the six who died on February 28 are subtracted from the 82 dead, we see that according to Clive Doyle, 74 Branch Davidians died in the fire. Clive Doyle's Complete List of Mt. Carmel Deaths. We now turn to the ID Matrix, which was obtained from the office of the Justice of the Peace in McLennan County. The handwriting on the matrix was present when the Museum received the document. Note that no organizational name appears on this matrix. The Doe Numbers are listed in the left column, followed by the identity assigned to the remains, the identification method, the date of identification, and comments. While reviewing the matrix, the reader should be warned that the methods used in tracking the remains during the forensic process were inconsistent. For example, Fetus Gent was given a separate MC Doe number in the ID Matrix (Mt. Carmel Doe 47C) but the not a separate Autopsy Report; the study of the remains were apparently done during the autopsy of the fetus's mother, Nicole Gent Little (Mt. Carmel Doe 47). In another case involving a fetus, the Fetus Summers was given a separate doe number and a separate Autopsy Report (Mt. Carmel Doe 31 B). The baby's skull at the top of the Death introductory page was Mt. Carmel Doe 51 A, but the ID Matrix does not have a corresponding number. The ID Matrix reveals that remains were assigned to 81 Davidian identities. Davidians Lisa Marie Martin, Sheila Renee Martin, Paulina Henry, and Startle Summers were not assigned specific remains. Identification Matrix, Sorted by Name: The ID Matrix, alphabetized according to name assigned to the remains. This document was compiled so that the reader could used the names as keys to look up the Mt. Carmel Doe number and the method of identification. Collated List of Mt. Carmel Casualties: The ID Matrix, collated with Clive Doyle's list of deceased and the FBI's list, as published in the The Washington Times on April 22. Note that the name "Jillane Matthews" appears on the FBI's "Unaccounted For" list published in The Washington Times on April 22, but does not appear in the ID Matrix, Clive Doyle's list of deceased, nor in any autopsy report.